On November 23, Ambassador Alexandre Fasel, Permanent Representative of Switzerland to the United Nations in Geneva hosted and chaired a diplomatic roundtable at the Palais des Nations on A Global Law to Ban Nuclear Weapons attended by delegations to the Conference on Disarmament, United Nations officials and representatives from disarmament non-governmental organizations. 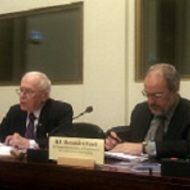 The roundtable featured speeches by founding Chair of the Middle Powers Initative Senator Douglas Roche and Parliamentarians for Nuclear Non-Proliferation and Disarmament Global Coordinator Alyn Ware. The two hour session hosted over 25 delegates and highlighted the Middle Powers Initiative briefing paper A Global Law to Ban Nuclear Weapons which focuses on key aspects of achieving a nuclear weapons-free world. Discussions included the value of preparatory work by non-nuclear weapon States on the framework for a nuclear-weapons-free world, the relationship between work outside the Conference on Disarmament and revitalizing the CD, the relevance of International Humanitarian Law to achieving progress, and ways to address the key drivers of nuclear deterrence in order to move the nuclear weapon states to join the process of nuclear abolition. Switzerland has been a key state advancing nuclear disarmament initiatives, including advancing the norm of illegality (under international humanitarian law), promoting steps to reduce nuclear dangers (such as de-alerting of nuclear weapons systems) and supporting the commencement of negotiations leading to the conclusion of a global framework for abolition – such as a nuclear weapons convention. The diplomatic roundtable was part of an ongoing speaking tour by Senator Roche to advance a Global Law to Ban Nuclear Weapons, and the respective Middle Powers Initiative Briefing paper, in which Ambassador Roche visited Beijing, New Delhi, Moscow, Oslo, Sweden, Brussels, Berlin and London (accompanied by Alyn Ware in the European capitals). Senator Roche and Alyn Ware also met with academic institutes and non-governmental organizations in Geneva, Lucerne, Bern and Zurich, and held a strategy meeting on with representatives of the Red Cross Societies of Australia, New Zealand and Norway on November 26 following the adoption by the Federation of Red Cross and Red Crescent Societies of a resolution on the role of Red Cross societies to advance the abolition of nuclear weapons based on the illegality of their use under international humanitarian law (See International Humanitarian Law, nuclear weapons and the role of parliamentarians).